The Global Muslim Brotherhood Daily Watch would like to introduce you to some of the members of the Association of Muslim Scholars (aka International Union of Muslim Scholars) so that you might fully understand with whom exactly the White House is seeking communication. The International Union of Muslim Scholars (IUMS) is headed by Qaradawi whose virulent anti-Semitism and anti-Americanism, as well as his support for suicide bombings in Israel, has been long covered by the GMBDW and need not be covered further here. 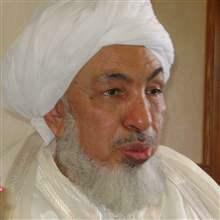 So, we will begin our introduction to the IUMS with the far less well-known Sheikh Bin Bayyah himself. “Zionism,” according to Ghannouchi. Zionism “represents a secular onslaught on the heart of our Islamic nation” (i.e. Palestine), which he has portrayed as a sort of virus spreading “octopus-like over the whole planet, embracing and transforming every aspect of existence by means of its economics, communications, arts, and literature, or — more crudely — through the presence of its fleets, intelligence agencies, and the recruitment of local converts . . .”, and thereby repressing “hope for a global liberation”. Zionism, Ghannouchi has written, is “hostile to every element rooted in ethical and religious principles”, spreading godlessness, greed and materialism. It would appear that Sheikh Abdallah Bin Bayyah also subscribes to the pillars of Islamized anti-Semitism as well. 7. In its origin and essence, this organization has Jewish roots and it is controlled secretly by a higher worldwide Jewish management. In its activities, it has a Zionist outlook. 8. In its real aims, it is against all religions. It undermines them in general and aims at tarnishing the religion of Islam in particular in the eyes of its followers. 9. It is always keen to select its members from the people who enjoy the outstanding academic, social, political, financial or any other status, so that it can effectively exploit their influence in their respective societies. That is why it is so keen to attract persons such as kings, presidents, ministers and senior government officials. 10. It has many branches that take different names in order to deceive and direct the people’s attention away from it. This way, it can carry out its activities under different names if it is met with resistance to the name of Freemasonry in certain environment. The branches which work under different names are most prominently known as Lions, Rotary and other outfits which harbour the sinister aims and activities that are totally against the foundations of Islam. It has become very clear to the Islamic Fiqh Council that there is a strong relationship between Freemasonry and International Zionist Movement. That is why it was able to control the activities of many officials in the Arab and non-Arab countries, especially with regard to the issue of Palestine, obstructing their crucial roles for this great cause in the favour of Jews and International Zionist Movement. For this and other detailed information about the sinister aims and activities of Freemasonry, the Islamic Fiqh Council decides that Freemasonry is one of the most dangerous organizations which aim at the destruction of Islam and Muslims, and that whoever associates with it, knowing its reality and objectives is an unbeliever. Third: From secularism spread destructive ideologies which invaded our countries under different names, such as racism, communism, Zionism, freemasonry, etc., which led to the dissipation of the Ummah’s resources and the deterioration of economic conditions. The result was the occupation of some of our holy lands, such as Palestine and Al-Quds. This is an indication of its failure to do our Ummah any good. Fourth: Secularism is a man-made system based on principles of atheism which run counter to Islam, in part and whole. It converges with international Zionism and calls for licentiousness. Therefore, it is an atheist sect that is rejected by Allah and His Messenger and by all the believers. (As noted above, the GMBDW editor was present during the entire affair and can remember no incident that threatened the participants, although there was some protest in the UK at the presence of Qaradawi). A single ruling on the dialogue with Jews cannot be generalized. The dialogue conducted between the Muslim and Jewish communities across Europe and USA is natural, especially if they are citizens of the same state. For the sake of coexistence, citizenship and a common interest in stabilizing their country through peace, they resort to dialogue amongst themselves. Moreover, if the Muslim communities avoid such a dialogue, this may cause them trouble. The Muslims have to distinguish between dialogue with the Jews transgressing on our land and holy places, and the Jews opposing this occupation. That is, there is a small group of Jews in the world who have a humanistic approach. This group stands strongly against the Israeli occupation and the Zionist project in the region. Hence, there is no harm in opening a channel of constructive dialogue with them to the interest of the Muslims. Speaking at a meeting with the Doha-based Muslim scholar Sheikh Yousuf al-Qaradawi, rabbis Ahron Cohen and Yisroel Dovid Weiss, who are activists at the Neturei Karta, a group known for its opposition to the establishment of Israel, said that the creation of Israel “was a heresy made up by the Zionists to undermine the true Jewish life”. “Theodor Herzel and his friends were just heretics. They are the worst enemy for the true Jews. According to the Torah, Jews are forbidden to have a state. All Jews should refuse the existence of the so-called state of Israel which tarnished our image. We will not lose hope and dream of dismantling the state of Israel,” said Weiss who called on Qaradawi at his house in Doha. Cohen and Weiss went on to blame Zionism for bloodshed in the region calling it “the root of all the evil in the region since the establishment of Israel.” Introducing themselves as Jews but not Zionists” , they said that Zionists should not be “mistaken for Jews.” Qaradawi has appeared with the Naturei Karta rabbis in public before and calls them “a big segment of Jews opposing the Zionist entity.” However, there appears to be no evidence that the group, descended from Hungarian Jews that settled in Jerusalem’s Old City in the early nineteenth century, has any substantial membership. Given Sheikh Bin Bayyah’s membership in the Islamic Fiqh Council which views Jews as part of a hallucinatory conspiracy to destroy Islam and Muslims, his role at the European Council for Fatwa and Research which believes the Protocols of the Elders of Zion to be an authentic reference document, and his enthusiasm for a cult of rabbis that seek the destruction of Israel, the GMBDW wonders what President Obama’s aid could have possibly meant by his “efforts to bring more understanding amongst humanity” unless Jews are to be somehow excluded from the humanity’s ranks.